SPACE.com compiled a list of the majorobservatories currently up doing space-based astronomy. The list excludesrovers, orbiters and planetary probes not doing traditional telescopeobservations. The granddaddy of space telescopes, Hubblehas been observing from Earth orbit for more than 19 years. Hubble, the firstof NASA's Great Observatories, has revolutionized astronomy, providing stunningimages of countless cosmic objects and giving astronomers their most distantviews of the universe with the Hubble Deep Field and Ultra Deep Field. Hubblehas shed light on the scale of the universe, the life cycle of stars, blackholes, and the formation of the first galaxies. Currently receiving its fifthand final makeover, Hubble is expected to last at least another five years, hopefullyoverlapping with its successor, the James Webb Space Telescope. The thirdof NASA's four Great Observatories, Chandra is the world's mostpowerful X-ray telescope. Chandra, named for Indian-American physicistSubrahmanyan Chandrasekhar, examines the X-rays emitted by some of theuniverse's strangest objects, including quasars, immense clouds of gas and dustand particles sucked into black holes. X-rays are produced when matter isheated to millions of degrees. Chandra has teamed up several times with othertelescopes, including Hubble, to take composite images of galaxies and otherdenizens of the cosmos. It has found previously hidden black holes, providedobservations of the Milky Way's own supermassive black hole, Sagittarius A*,and even taken the first X-ray images of Mars. Spitzer wasthe last of the Great Observatories to be launched and gathers the infraredradiation emanating from cosmic objects, including faraway galaxies, blackholes and even comets in our own solar system. (Infrared radiation is hard toobserve from the ground because it is largely absorbed by the Earth'satmosphere.) Spitzerwas the first telescope to see light from an exoplanet, which it was notoriginally designed to see; it took the temperatures of so-called "hotJupiters" and found that not all of them are really hot. Spitzer is aboutto use the last of the liquid helium coolant that has kept its instrumentschilled for the past 5.5 years. Spitzer's instruments will be able to keepgoing for another two years, meanwhile, the European Space Agency's Herscheltelescope is designed to pick up where Spitzer left off. 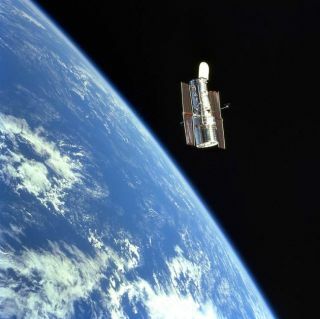 Herschelwas lobbed into space on May 14, along with the Planck telescope. Herschel willbe the largest, mostpowerful infrared telescope, looking at the far-infrared to sub-millimeterwavelengths of light generated by some of the coldest objects in space.Herschel is designed to look for water, both in nearby comets and faraway dustclouds, and will also peer into the womb of star formation. Astronomers expectto catch a glimpse of baby stars in the act of forming ? something they havenever before been able to see. Like its predecessor Spitzer, Herschel will alsotake a peek at a few exoplanets. Herschel's launchpartner, thePlanck Observatory, will be concentrating on the microwave light of theuniverse. Planck will be looking at the remnants of the first light to shinefreely in the universe, the Cosmic Microwave Background (CMB). Planck willfollow in the footsteps of NASA's Cosmic Background Explorer (COBE) and WMAP,mapping the CMB and providing the most detailed measurements of the temperaturevariations in the remnant light. Planck will also probe the mysteries of darkmatter and dark energy and map the magnetic field of the Milky Way in 3-D.
Also new tothe space scene is Kepler, NASA's new planet-huntingtelescope that will specifically be searching for other Earth-like planetsin the galaxy. Kepler will be looking for characteristic variations in thelight from a pre-selected target group of 100,000 stars. Dips in the light fromthe stars can indicate a planet passing in front of the star (from Earth'sperspective). Astronomers are hoping that Kepler fill find planets in thestars' habitable zones, where temperatures are just right for liquid water toexist. After getting settled into its new orbital home, Kepler officially beganits search in May. First light from the telescope came on April 16. Fermi(formerly GLAST) joined the ranks of the space telescopes last summer, and hasalready given astronomers their best-ever view of the most extreme energy inthe cosmos: gammarays. Gamma rays can reveal some of the most energetic and mysteriousevents in the universe, including dark matter, black holes and spinningpulsars. Not longer after arriving in orbit, it took an all-sky map that showsgamma rays from numerous sources, including our own sun. The Fermi team usedthe map to crate a "top 5" list of gamma ray sources. Fermi has alsodetected the highest energy gamma ray burst yet. Like Fermi,Swift also scans the sky for gamma rays, specifically looking for gamma-raybursts (GRBs), the most powerful explosions in the universe. GRBs flash forjust a few seconds before sliding into an afterglow of X-ray, ultraviolet andvisible light. Swift can detect a GRB and within a minute point itself at theevent for quick observations, with its instruments following along as theburst's light moves through the spectrum. In 2007, Swift spotted a GRB with thelongest lived afterglow yet recorded, more than 125 days. Swift has alsorecorded the most distant cosmic explosion ever seen, a gamma-ray burst from astar that died when the universe was only 630 million years old, or less than 5percent of its present age. ESA'sInternational Gamma-Ray Astrophysics Laboratory was the first space observatorythat can simultaneously observe objects in gamma rays, X-rays and visiblelight. INTEGRAL,like Fermi and Swift, is tasked with looking for gamma-ray bursts, but it alsokeeps an eye out for supernova explosions and peers into regions in the universethought to contain black holes. Astronomers hope that Integral's observationswill help them learn more about how elements are formed when a star dies andcould help us better understand the massive black hole lurking in the center ofour own galaxy. Moving toshorter wavelengths in the electromagnetic spectrum, we have the X-rayMulti-Mirror Mission ? Newton, named in honor of Sir Isaac Newton. XMM-Newton'sinstruments allow it to make long, uninterrupted observations; it can detectmore X-ray sources than any previous satellite. XMM-Newtonhas found detected galaxies billions of light years away from Earth, observedmagnetars (a strange type of neutron star) and star-forming regions, andinvestigated what happens in and around black holes. The mainmission of NASA's GalaxyEvolution Explorer is to help better understand the formation of galaxies.It studies the shape, brightness, size and distance of galaxies beyond theuniverse. Since its launch, GALEX has imaged more than a half-billion objectsacross two-thirds of the sky. The telescope's first observation, of the sky inthe constellation Hercules, was dedicated to the crew of the Space ShuttleColumbia. GALEX has detected star formation in unexpected regions of theuniverse and spotting Mira, a fast-moving older star called a red giant. Now we're backdown to the spectrum to the wavelengths we humans can see. The ConvectionRotation and planetary Transits mission has two objectives: to search forextrasolar planets that orbit close to their sun and to conduct stellarseismology. COROT spotted its first exoplanet in 2007. Earlier this year, COROTscientists made a controversial claim that the telescope had discovered the smallestknown exoplanet. In 2008, it found an object that scientists think couldeither be a brown dwarf (a failed star) or a planet. While othertelescopes are busy looking at distant stars, SOHO is focused on our own. SOHO was designed to study the structure and dynamics of the interior of the sun, as wellas the solar wind, the stream of charged particles ejected from the sun's upperatmosphere. Understanding these solar phenomena is key to making betterpredictions of space weather, such as solar flares, which can affect electricalgrids and communication networks here on Earth. To date, SOHO has taken thefirst imagesof the sun's convection zone, shown the structure of sunspots below thesun's surface, and discovered new phenomena, such as solar tornadoes. SOHO has also spotted 1,500 new comets. Anothersolar observer, the STEREO (Solar Terrestrial Relations Observatory) mission isactually two separate spacecraft that after launch moved apart so that onetrails Earth and the other leads it. These positions allow for stereoscopicimaging of the Sun and solar phenomena. STEREO has taken 3-D images of solarstorms known as Coronal Mass Ejections (CMEs). These powerful solar eruptionsare a major source of the magnetic disruptions on Earth, interrupting satelliteoperations, communications and power systems. There areof course other missions being pursued by NASA, ESA and other space agencies;some are already up and space, while others are just in the planning phases. One of thebig missions scientists are anticipating is the James Webb Space Telescope,which will be the successor of Hubble. In fact, "it is designedspecifically to build on Hubble's legacy," said Jon Morse, NASA'sAstrophysics Division director. It will searchfor light from the first stars and galaxies which formed in the universe afterthe Big Bang to better understand how stars and star systems form. The projecthas met some delays and cost overruns, and the telescope is currently slated tolaunch in 2013. "Thatwill be a decade of frontier astronomy with JWST," Morse said. But JWSTisn't the only telescope in the works, and Morse expects this golden age tocontinue for some time. "Therewill continuously be interesting things to do with missions of all sizes, so Ilook forward to an exciting portfolio well into the coming decades," Morsesaid.